Banners for golf courses and golf tournaments. Golfflags.com supplies fantastic quality Pop-up banners and Range targets for golf courses and golf tournaments. The products are printed in full colour and high definition. With custom banners, you can create a tournament with your own corporate look. This is an ideal way to get the most from company tournaments. Your corporate image will be on show all across the golf course. 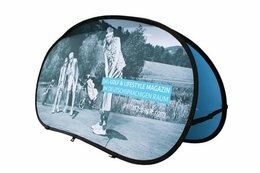 Pop-up banners and Range targets can be part of a golf tournament package. Golfflags.com offers you the opportunity to buy your banners online. Through our international domain and strategy, we can produce flags on a huge scale and we offer the best price/quality ratio on the market. From us you can buy competitively priced banners . The prices are clearly marked on the website next to the various products. Our banners are robust and sturdy. The full-colour printing is done in high definition. 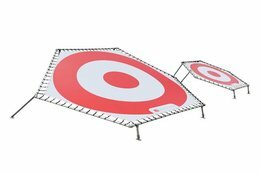 Both the Pop-up banners and the Range targets include ground pegs to fix them securely into the ground. 7. Order your banners and pay securely. Why order Banners at Golfflags.com? For questions or advice, contact us via +31 (0) 85 401 4648 or email info@golfflags.com.